In this section, we have provided some basic information on some of the most important Buddhas, Bodhisattvas, and gods in the Mahayana Buddhist tradition. One of the defining characteristics of Mahayana Buddhism is the vast pantheon of Buddhas, Bodhisattvas, gods, and other beings. Each of these may be understood together or individually as aspects of our minds that seek awakening, and aspects of Buddha Reality itself reaching out to awaken beings. Shakyamuni Buddha is often referred to as the historical Buddha, the founder of Buddhism, who lived in northeastern India ca. 500 BCE. Shakyamuni Buddha’s personal name was Siddhartha Gotama, but after his awakening he came to be called the Buddha, “the awakened one.” The name Shakyamuni means “the sage of the Shakya clan.” Shakyamuni Buddha discovered the Dharma (the Truth) and revealed it in our world to teach beings the path to awakening. For more information on Shakyamuni Buddha see our Life of the Buddha page and suggestions for further reading. For more information on the early teachings of Shakyamuni Buddha, see our page on Basic Buddhist Teachings and suggestions for further study. In Japanese, the name Dainichi means “Great Sun,” this symbolizes the all-pervasive nature of Buddhahood, like how the sun shines on all things. The Sanskrit name Maha-vairocana caries a similar meaning, “Great Luminous One.” Mahavairocana is a central object of reverence in Japanese Esoteric Buddhist traditions, signifying the totality of all of reality: all forms are aspects of his body, all thoughts are aspects of his mind, and all sounds are aspects of his speech. Awakening is in us, and all around us. It is us, and we are it. But from our ordinary frame of mind, we do not always perceive this to be true. This Buddha signifies the Dharma-kaya concept, Ultimate Reality, reality as it truly is, and that Ultimate Reality is not apart from our ordinary reality. For more information on the Dharma-kaya, Esoteric Buddhism, and so on, see our Mahayana Basics page. In Tendai Buddhism Mahavairocana is associated with Shakyamuni Buddha as depicted in the Lotus Sutra. 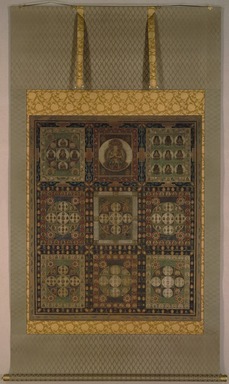 Mahavairocana is the central Buddha in the Taizokai and Kongokai Mandalas (see below), and is the principle Buddha of the Vairocanabhisambodhi sutra, Vajrashekhara sutra, and others. In traditional Mahayana Buddhist cosmology, there are infinite worlds and infinite Buddhas and Bodhisattvas working throughout this multi-verse to aid beings in the pursuit of awakening. The Buddha Amitābha is the Lord of Sukhavati, the Pure Land of Bliss. The Three Pure Land Sutras depict Sukhavati as a divine realm beyond the pain and suffering of this world into which beings may be reborn. Therefore, Amitābha and his Pure Land have often been associated with deathbed practice. And yet, in traditional Mahayana practice and thought, the Pure Land “out there” is revealed to be no different than the Pure Land right here and now. 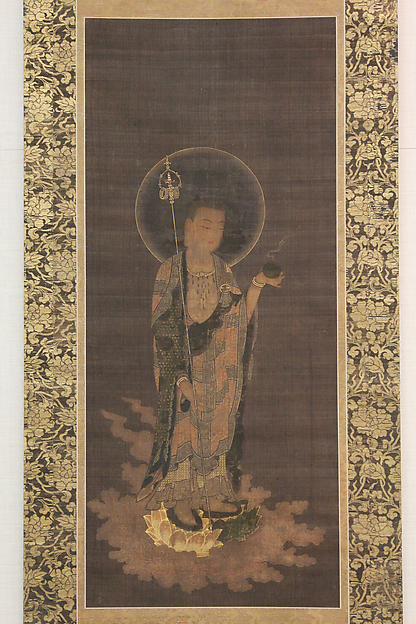 In the same way, Amitabha Buddha may also be regarded as an expression of your innate Buddhahood. Like its Chinese counterpart, the Japanese Tendai School greatly popularized devotion to the Buddha Amitābha as the dominant form of lay and elite Buddhist practice. Through chanting the mantra of Amitābha, or the nenbutsu (recitation or contemplation of the name of Buddha), one is said to attain rebirth in Sukhavati right here and now, and in the life to come. For more information, see our discussion of Pure Lands in our Mahayana Basics page. The Buddha was often described as a doctor, one who dispenses particular teachings based on the particular afflictions one had at particular times. This idea of Buddha as doctor is further developed in the form of the Medicine Buddha, said to reside in a purified realm to the east of our world. The Medicine Buddha helps beings in the pursuit of health and longevity, fortunate rebirth, and ultimately the achievement of awakening. The Medicine Buddha has been extremely popular across Himalayan and East Asian Buddhist countries, and is the main Buddha image of Enryakuji, the head temple of the Tendai School located on Mt. Hiei. Also, the Medicine Buddha is the central image of the main Hall (Jiunzan Tendaiji) of the Tendai Buddhist Institute. A Bodhisattva is a being (sattva) on the path to awakening (bodhi): an “awakening being.” Anyone who has taken the Bodhisattva Precepts (see page on Buddhist Practice) is technically a Bodhisattva. According to the Lotus Sutra, however, in fact, all beings are always-already enroute to Buddhahood. We are already Bodhisattvas in training. In Mahayana Buddhism there are a number of Bodhisattvas said to be aiding beings on the path. These advanced “cosmic” bodhisattvas are, alongside Buddhas, popular objects of devotion in their own right, but they as well as can also be understood as aspects of one’s own mind. Some of the more famous are examined below. Often referred to as the Bodhisattva of Compassion, Avalokiteshvara’s name in Sanskrit means something like, “The Lord who looks down and hears the cries of the world.” This Bodhisattva symbolizes the compassionate activity of the Buddhas. In the “Kannon Sutra” (a popular Japanese name for Chapter 25 of the Lotus Sutra, see below), it is said that calling upon this Bodhisattva will deliver you from peril and aid you in the pursuit of awakening. Avalokiteshvara Bodhisattva has often been associated with motherly compassion, and therefore is often depicted in the female form and regarded as the protector of women and children especially. 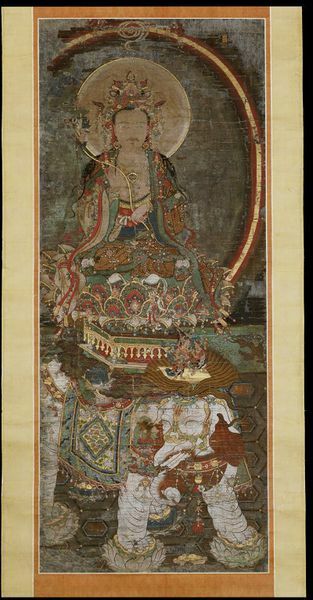 Avalokiteshvara is closely associated with the Buddha Amitabha and his Pure Land, and is arguably one of the most popular objects of devotion in East Asian and Himalayan Buddhist cultures. The Dalai Lama, the spiritual leader of the Tibetan Buddhist tradition, is said to be an emanation of Avalokiteshvara. Manjushri is the Bodhisattva of Wisdom. He is often depicted holding the sword of wisdom and a sutra. 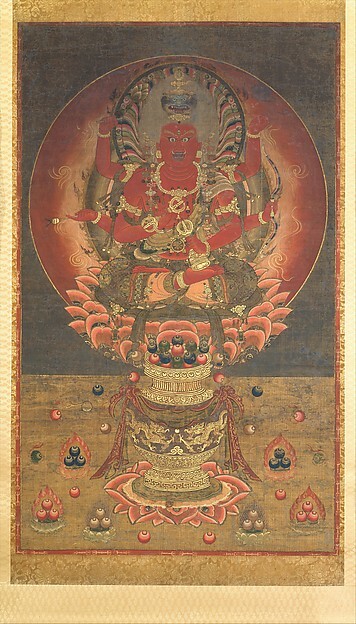 Manjushri often appears as an attendant of Shakyamuni along with Samantabhadra Bodhisattva (see below), and is the leader of the great Bodhisattvas. As the Bodhisattva of Wisdom, Manjushri is closely associated with the Perfection of Wisdom (Prajna-paramita) school of Mahayana philosophy. The wisdom that this Bodhisattva imparts is the wisdom of Shunyata. When the great Tendai monk Ennin (793-864) traveled to China, he visited Mt. Wutai, a holy site associated with Manjushri. Upon his return, he built a famous shrine to Manjushri on Mt. Hiei. Samantabhadra is often depicted riding a white elephant, and appears alongside Manjushri, the Bodhisattva of Wisdom, as an attendant of Shakyamuni. While Manjushri symbolizes the wisdom and attainment of the Buddhas, Samantabhadra symbolizes Buddhist practice. Samantabhadra is the protector of Lotus Sutra practitioners, and his worship is promoted in the final chapter of the Lotus (see below). Zhiyi, the founder of the Chinese Tiantai tradition incorporated practices concerning Samantabhadra into the Lotus Samadhi. The Flower Garland Sutra (Avataṃsaka-sutra; Kegon-kyo) also contains a chapter dedicated to Samantabhadra wherein we find the famous 10 Great Vows of Samantabhadra (also below). In the Tibetan Buddhist tradition, Samantabhadra is associated with the Dharma-kaya. According to tradition Buddhist understanding, the teachings of the Buddha only last for so long. Like all things, they too will eventually perish. When that happens, however, there will be a new Buddha. It is said that Shakyamuni Buddha himself predicted that his successor was a Bodhisattva named Maitreya. Currently, it is believed, Maitreya is residing in a heavenly realm called Tushita. When the time comes, he will descend into this world and reveal the Dharma once again. Devotion to Maitreya is common across Mahayana and non-Mahayana traditions alike, as many Buddhists aspired to be reborn in Tushita, or into this world at the time when Maitreya appears. In East Asia devotion to Maitreya at times rivaled in popularity devotion to Amitābha. Ksitigarbha was an obscure Bodhisattva in Indian Buddhist culture, but in East Asia he came to be associated with delivering beings from the netherworld, and so became very popular. In Japan he is known as Jizo, and is popularly regarded as a protector of women, children, and travelers. Recently, memorial services focused on Jizo Bodhisattva have been performed for children who die young, babies are born stillborn, or fetuses that are aborted. Jizo Bodhisattva’s relatively unadorned and humble appearance differs from other Bodhisattvas. This is said to symbolize his vow to remain in all of the realms of death and rebirth until all beings are liberated. One of the defining characteristics of the tantras (a genre of ritual texts associated with Esoteric Buddhism, Vajra-yana, and Tantric Buddhism- see Mahayana Basics) is the inclusion of “wrathful” deities who symbolize the power of Buddha Reality to wake us forcefully from our delusion. Most Buddhas and Bodhisattvas may take on “wrathful” forms. Due to the popularity of the tantras in Tibetan and Japanese Buddhism, these expressions of Buddha Reality are more popular. The class of wrathful emanations of the Buddhas most popular in Japan are known as Myo-o, meaning “wisdom king.” For more information on Myo-o in Japanese Buddhism and Japanese Buddhist iconography, click here. 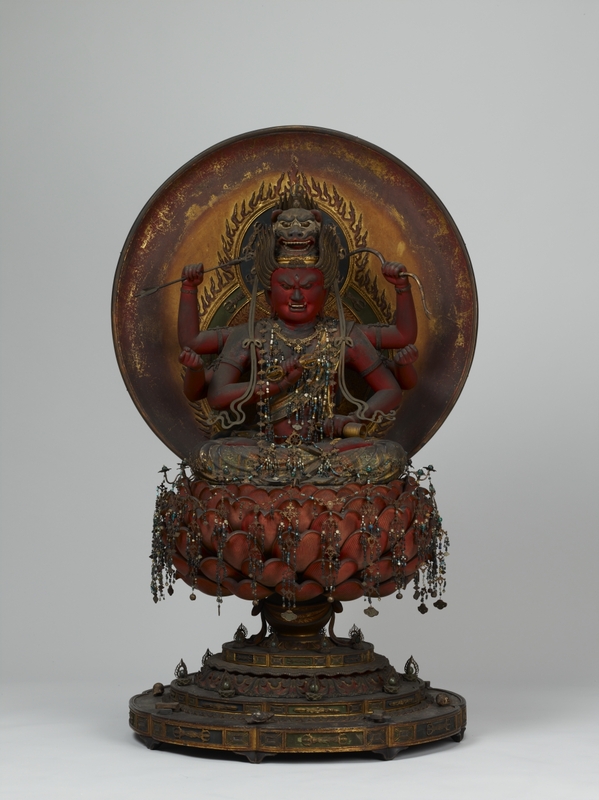 Acala, or Fudo, the “Unmovable One,” is one of the most popular objects of devotion in Japanese Buddhism, prevalent in Tendai, Shingon, and Zen traditions. Fudo Myo-o is the wrathful emanation of Mahāvairocana Buddha, the Cosmic Buddha, Ultimate Reality, or the Dharma-kaya. Each element of Fudo Myo-o’s imagery imparts his dedication to aiding beings: his hair is tied in a “slave knot,” indicating his devotion, his sword symbolizes cutting our attachments, and the flames that engulf his form symbolize the purification of our afflictions. Finally, he sits or stands atop the unmovable stone, symbolizing his dedication to helping beings. The word “ai” in Aizen Myo-o’s name symbolizes his “love” for the Buddhas and ordinary beings. Aizen, like Fudo Myo-o, is a wrathful emanation of Mahāvairocana Buddha, and is also associated with Vajrasattva Bodhisattva. Aizen Myo-o is also said to aid beings with especially strong afflictions. That Buddhism is non-theistic does not mean that Buddhism is fundamentally “atheistic” (though some traditions do reject both “God” and “the gods”). While Buddhists do not believe in a Creator God, many of the gods from traditional Asian religions were converted into protectors of the Dharma as Buddhism spread throughout India and beyond. As with the Buddhas and Bodhisattvas, in some cases the gods may be conceived of as entities beyond oneself, however, in Mahayana Buddhism, especially Tendai Buddhism, they are often conceived of aspects of this very mind, and channels to Buddha Reality. 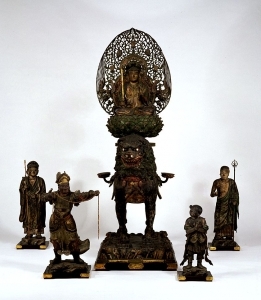 For more information on the gods in Japanese Buddhism, click here. Ganesha is the Hindu god of obstacles, commonly referred to as “The Remover of Obstacles.” However, Ganesha is also seen to have a dual nature, also, as a kind of trickster who may place obstacles in your path to be overcome. In Japanese Buddhism (which largely retains the Hindu pantheon), this dual identity is expressed in depictions of Ganesha (named either Shoten or Kangiten) as having dual bodies, male and female, often in an embace. 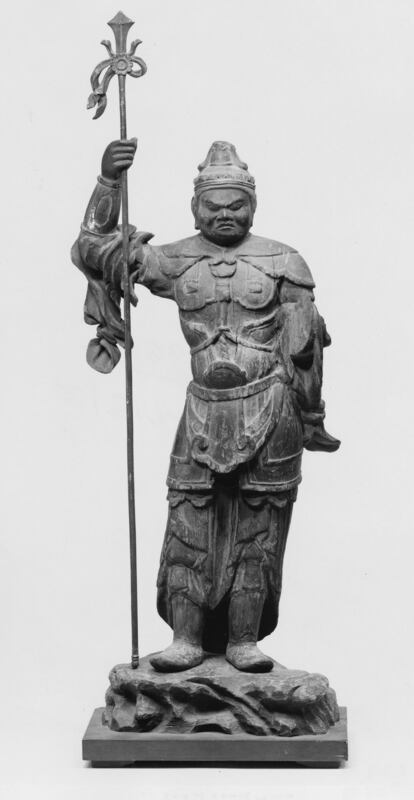 Bishamon-ten is one of the Seven Gods of Good Luck in Japan, and one of the four guardian kings in Mahayana literature, associated with the northern direction. He is associated with warriors and wealth. He is an important protector of the Dharma. 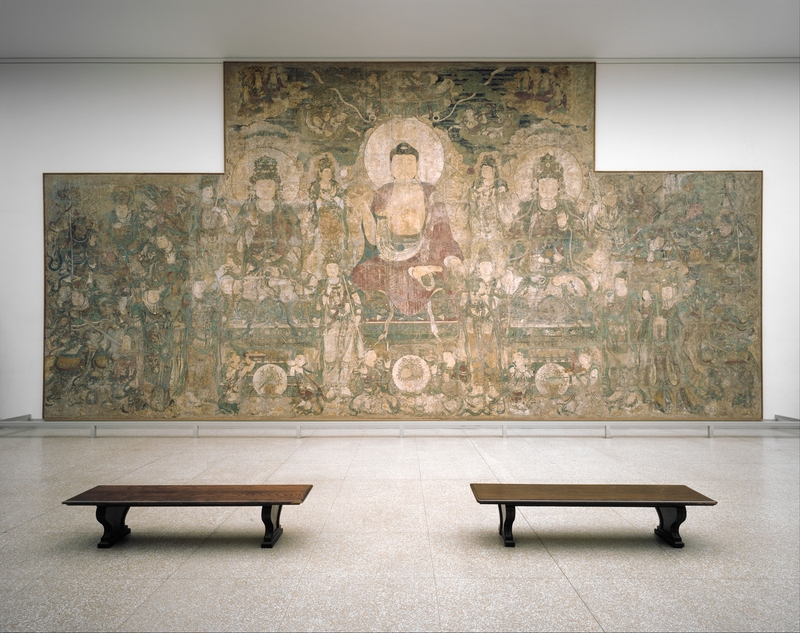 An image of Bishamon may be found on the central altar of the main hall (Jiunzan Tendaiji) of the Tendai Buddhist Institute. The word “mandala” often refers to a geometrically arranged iconographic representation of Buddha Reality, or some aspect of Buddha Reality. Some mandalas depict hundreds of Buddhas, Bodhisattvas, and gods, others depict a single being or a sacred place like a mountain. A mandala may be a focal point of one’s meditation, a guide to visualization practice, or an object of devotion in its own right. In Japanese Buddhism there are two main mandalas: The Womb Realm Mandala (Taizokai Mandara) and the Vajra Realm Mandala (Kongokai Mandara). Each of these mandalas may be taken as a depiction of Ultimate Reality, reality as it truly is, from two different perspectives. The Womb Realm Mandala (Taizokai Mandara) is often associated with the Dainichi-kyō (Vairocanābhisaṃbodhi), an important early Buddhist tantra (ritual text). The Womb Realm Mandala is said to represent Buddha’s universal compassion, presenting a view of the universe as a compassionate womb within which the Buddha nature of all beings, our innate capacity for awakening, is cultivated and realized. There are 414 beings depicted in the Womb Realm mandala, Buddhas, Bodhisattvas, gods, nature spirits, and ordinary beings. This symbolizes the inclusivity of this view of reality, all beings are included and on the path to awakening. The Vajra Realm Mandala (Kongōkai Mandara) is associated with the Kongōchō-kyō (Adamantine Pinnacle Sutra). The Vajra Realm Mandala is paired with the said to represent the Buddha’s wisdom and spiritual practice. 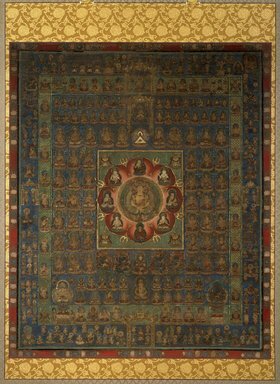 There are 1,416 beings included in the Vajra Realm Mandala. The visualization practices, mudras, and mantras, associated with the Taizokai and Kongokai mandalas are taught as part of the training program for priests. These forms of meditative practice lead the practitioner to recognize their own innate Buddha nature. For lay Buddhists, however, studying the mandalas, making offerings to the mandalas, and so on, may bring great benefits. The Tendai School also developed their own unique mandalas. The Lotus Sutra is central to the Chinese Tiantai tradition from which the Japanese Tendai tradition emerged. 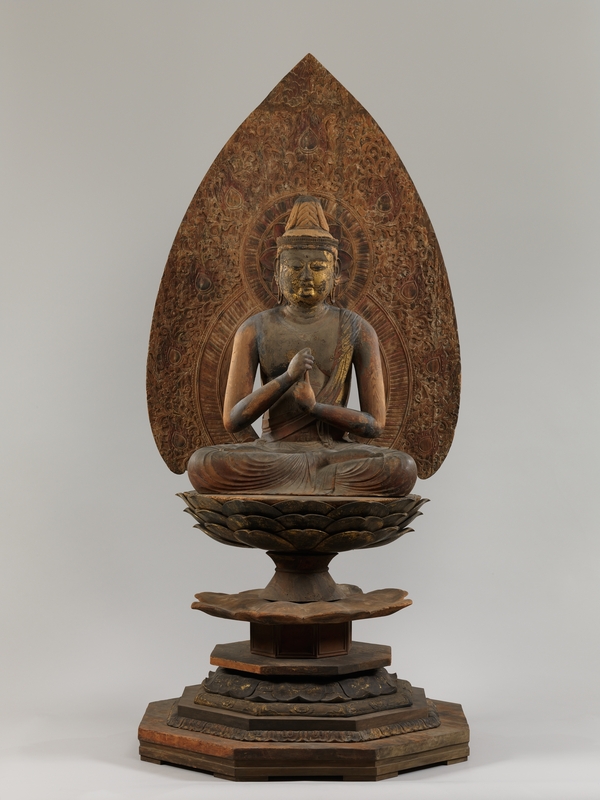 In Japan, as Esoteric Buddhism emerged as a major feature of Japanese Buddhism in general, and Tendai Buddhism in particular, some Tendai Buddhists used mandalic depictions of events form the Lotus Sutra in their Buddhist practice. This Hokke Mandala (Lotus Mandala) depicts Shakyamuni Buddha sitting next to Prabhutaratna Buddha, a key scene from Chapter 11 of the Lotus Sutra. The importance of this scene comes from the appearance of two Buddhas, at a time when it was believed by many Buddhists that there could be only one Buddha in the world at a time. In this way, this image opens up the possibility for all beings to attain awakening. While many introductory textbooks on Japanese religion present Shinto as the ancient indigenous religion of Japan. The term Shinto is often translated as “the way of the gods.” However, the Japanese word Shinto actually comes from the Chinese word shendao, which is a Buddhist technical term referring to non-Indian gods. In fact, Shinto developed with, and in some sense out of Japanese Esoteric Buddhism, and it was often through Esoteric Buddhist rituals that the gods of Japan (kami) were engaged. Sanno Shinto, aka Sanno Ichijitsu Shinto (Mountain King One Reality Shinto), is a Shinto tradition specifically associated with the Tendai School of Japanese Buddhism. 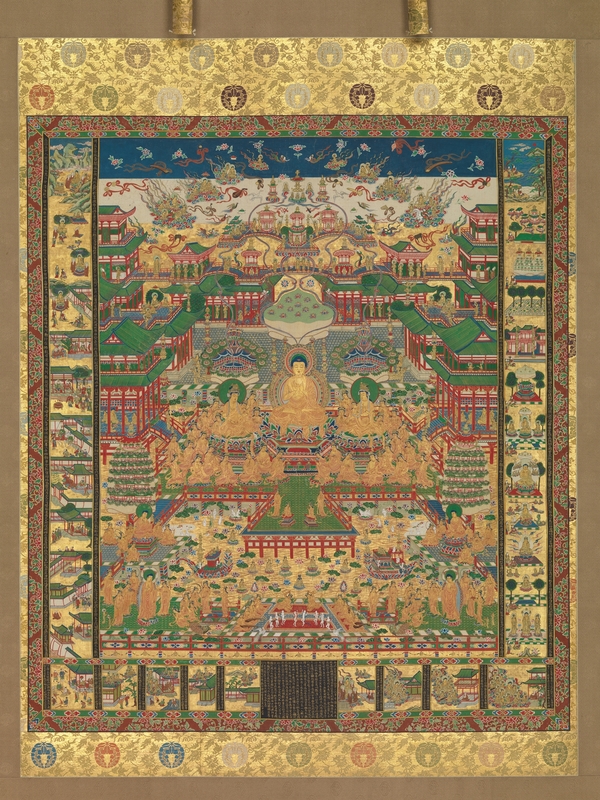 Depicted here is the Sanno Mandara, wherein the gods of Hieizan, the mountain home of the Tendai School, are represented as emanations of Buddhas and Bodhisattvas protecting the Dharma. 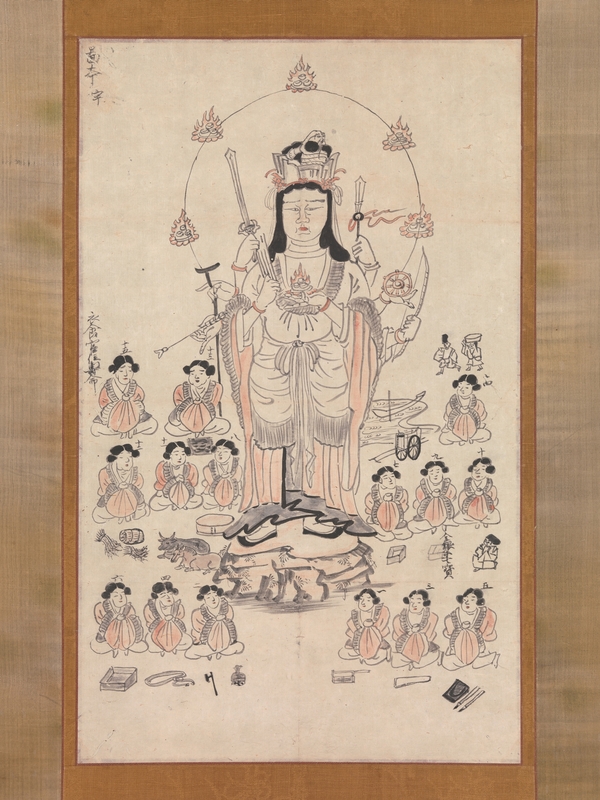 The principle diety the Mountain King is revealed to be an emanation of Shakyamuni Buddha, and is associated with Amaterasu, the Japanese Sun Goddess. 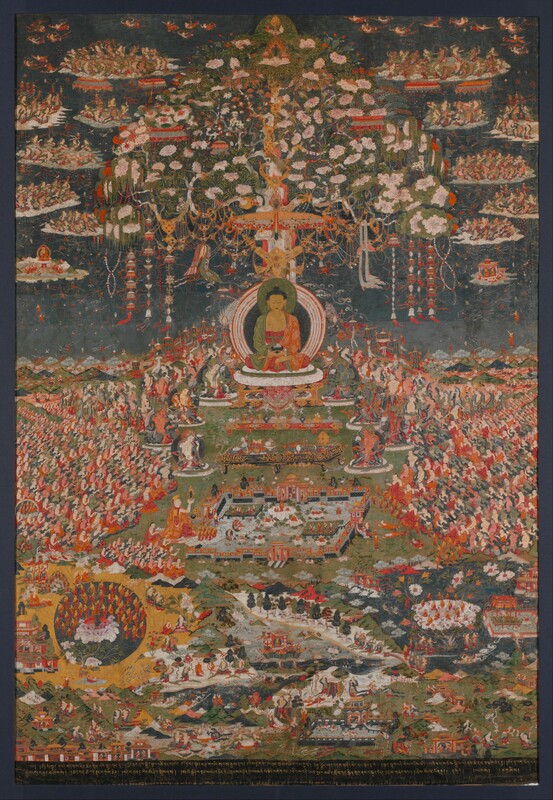 Other schools developed their own unique approaches to the gods, often blending the gods of India, China, and Japan, and linking these with various Buddhas and Bodhisattvas.